Objective: Cisplatin is a potent chemotherapeutic agent that is used against a variety of tumors. The most common side effect of cisplatin is ototoxicity. This dose-related hearing impairment is high frequency, bilateral, and permanent. Unfortunately, there is no prophylactic protocol, and, in current clinical practice, the treatment of cancer with cisplatin is interrupted when ototoxicity develops or the resulting hearing impairment is tolerated as an acceptable side effect of cancer treatment. The aim of this study is to compare transtympanic injections of N-acetylcysteine and dexamethasone (both of which have shown substantial otoprotective activity) for the prevention of cisplatin-induced ototoxicity. Methods: A double blind randomised clinical trial study of 60 cisplatin-treated patients was performed in Shahid Sadoughi Hospital in 2016-2017. Transtympanic injection of N-acetylcysteine (10%) and dexamethasone was performed. Hearing acuity was evaluated by an audiologist blinded to the treated ears before each cycle with pure tone audiometry (PTA) and six months later. Results: Altogether, 114 transtympanic infusions were performed (57 in each group). The data were analyzed by the Fisher test and chi-squared. In the ears with N-acetylcysteine, no significant changes in auditory thresholds were recorded. In the ears with dexamethasone, cisplatin induced a significant decrease of auditory thresholds at the 8000 Hz frequency band (P = 0.001). Conclusion: Transtympanic injections of N-acetylcysteineas a safe and inexpensive antioxidant agent seem to be an effective otoprotective strategy for the prevention of cisplatin-induced ototoxicity and for increasing the quality of life, especially in children. Cisplatin (cis-diamminedichloroplatinum) is a potent chemotherapy drug, which is an alkylating agent that is used extensively against many solid tumors (including bladder, testicular, ovarian, and mammillary tumors), hematologic malignancies, and cancers of the head and neck. Cisplatin also is a radiosensitizer agent that provides a synergistic effect with radiotherapy. However, a major side effect of cisplatin is its ototoxicity. The drug induces high-frequency, sensory, neural, doserelated, cumulative, progressive, bilateral, non-reversible hearing loss. Therefore, it has a severe negative effect on patients' quality of life and increases life threatening risks as the result of hearing loss [1,2]. Currently, by increasing patients’ survival rates with many cancers, especially in children, the drug has become very important in maintaining quality of life and protecting patients against the side effects of chemotherapy . The prevalence of hearing loss caused by cisplatin therapy is over 69%, with the affected range being 15 to 65 db at frequencies of 4000-8000 Hz . Hearing losses occur in 15% of patients who are treated with this drug. Ototoxicity in children is in the range of 50-60%, which can result in academic difficulties, fatigue in the learning environment, and social and emotional problems [2,3]. In various experimental studies and clinical trials, different drugs have been investigated systematically and sometimes locally for otoprotection when cisplatin is used. However, a protocol has yet to be developed to protect hearing from the effects of cisplatin. Thus, in current clinical practice, when ototoxicity occurs, then use of the drug is discontinued or chemotherapy is continued using a different drug. However, both approaches can result in the failure of the chemotherapy and the recurrence of the cancer. The only other option is to tolerate the drug’s side effect of destroying hearing in order to continue the treatment of the cancer [2-9]. The aim of this study was to comparethe positive effects of the intratympanic injection of N-acetylcysteine and dexamethasone for the prevention of the ototoxicity that results from cisplatin injections. This study was conducted as double blind clinical trial on 60 patients between the ages of 6 and 60 who were suffering from cancer and were referred to the internal ward at Shahid Sadoughi University of Medical Sciences in Yazd, Iran, for chemotherapy during 2016 and 2017. The Ethics Committee at Shahid Sadoughi University of Medical Sciences approved this study. This study was conducted as double blind clinical trial on 60 patients between the ages of 6 and 60 who were suffering from cancer and were referred to the internal ward at Shahid Sadoughi University of Medical Sciences in Yazd, Iran, for chemotherapy during 2016 and 2017. The Ethics Committee at Shahid Sadoughi University of Medical Sciences approved this study. patient or a caregiver. The exclusion criteria were patients with severe hearing impairment, a history of head trauma, brain tumors,the final stages of cancer, taking other ototoxic drugs, history of infection, surgery, ruptured eardrums, meningoencephalitis, acoustic trauma, and cranial radiation. To begin the study, conventional pure tone audiometry (PTA) was conducted for all patients by an audiologist blinded to the treated ears (audiometer; amplaid 311, Type 1 IEC645 and acoustic room). Injections were done during hydration before injecting cisplatin and the number of injections was proportional to cisplatin-therapy cycle. An hour before the injection, all pediatric patients received an oral analgesic (midazolam 0.5-1 mg/kg) according to their weight. Injection under a microscope was done after local anesthesia. The local anesthesia that was used was a 10% solution of lidocaine, which was noninvasive. After 15 minutes of being motionless, the local anesthesia was administered for the contralateral ear. N-acetylcysteine was diluted to 10% using Ringer's lactate and dexamethasone 24 mg/ml was provided by a technician and syringes were labeled as A and B in similar volumes of 1 cc before the provider entered the room. Both medicines are manufactured by Iran Daru-Pakhsh, and this brand was used throughout the study period. After careful suction of any remaining lidocaine from the external ear canal, the injection was done using 26 gauge syringes until the middle ear was filled (0.4- 0.8 ml). Then, the patient remained motionless in that position for 15 minutes, and, then the procedure was repeated for the contralateral ear. A study was followed by PTA six months after therapy to determine the changes in the hearing threshold. Data analysis was conducted using the GEE model (a gamma distribution with a log link), chi-squared, and Fisher's Exact Test. P values ≤ 0.05 were considered to be significant. After inclusion and exclusion criteria were applied, 60 patients were available for the study. Three patients left the study, and we continued the investigation with the remaining 57 patients. There were 31 men (54.4%) and 26 women (45.6%). The mean age was 32.4 ± 22.1, and the participants’ ages ranged from 6 to 60 (Table 1). There were no significant differences in age, gender, or the type of cancer between two groups in hearing threshold (P>0.05) (Table 2). Table 2. Correlation between hearing threshold and number of injections. The times of injections were proportionate to the cycles of cisplatin therapy for the patients, i.e., one (42.1%), two (40.4%), or three (17.5%) injections. Hearing thresholds increased in the patients who had more cisplatin cycles (P<0.05) (Figure 1). 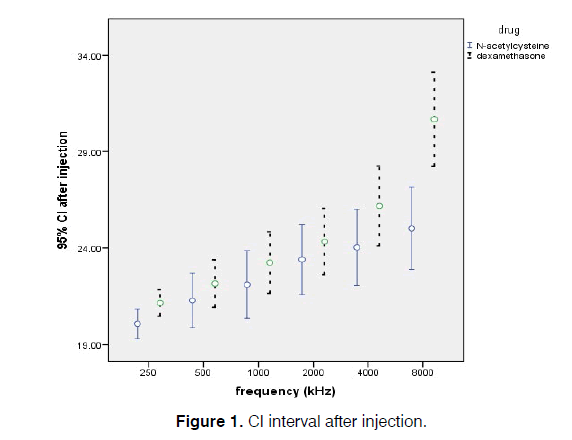 Figure 1: CI interval after injection. Hearing thresholds increased significantly after the cisplatin therapy in the dexamethasone group but not in the N-acetylcysteine group (P<0.001). However, N-acetylcysteine had good otoprotection against cisplatin-induced ototoxicity. These increases occurred to a greater extent at the higher frequencies, such as 4000 and 8000 Hz (P<0.001) (Table 3). Table 3. Tinnitus and otoprotective drugs. In the evaluation of tinnitus, nine cases were excluded either because they had previous tinnitus or they were not cooperative. No tinnitus was noted in the N-acetylcysteine group, whereas 20 participants in the dexamethasone group had tinnitus with various severities (P<0.001 Fisher’s test). Currently, platinum-based chemotherapy is the most effective chemotherapeutic method for head and neck cancers. Cisplatin is more effective than carboplatin, but its higher ototoxicity decreases patients’ quality of life and even limits the use of different therapeutic protocols [1-10]. Cisplatin is a non-cell, cycle-specific, alkylating agent that damages cells’ genes through various mechanisms. First: The main mechanism is its adherence to and alkylation of DNA, terminating the replication of the DNA and finally resulting in apoptosis . Second: It reduces ATPase activity and creates changes in cellular transportation. Third: It produces reactive oxygen species (ROS), increases ROS, and decreases glutathione and antioxidant enzymes, thereby causing apoptosis cascade in cochlear cells, especially outer hair cells, which have lower glutathione reserves and more susceptibility [12-15]. Ototoxicity starts with the involvement of outer hair cells in the basal turn of the cochlea, which decreases hearing in the high frequencies. By progressive damage, the inner hair cells, spiral ganglion, striavascularis, and subtenacular cells also become involved [16-18]. In this study, first, the involvement at higher frequencies (8000 Hz) was observed, and when the cisplatin therapy cycle was increased, hearing loss reached the mid-frequency range . There have been a few clinical trials that investigated otoprotective strategies, but, often, no appropriate control group was used. Many factors affect cisplatin ototoxicity, including age, genetic differences, cumulative dose and concomitant administration of other ototoxic drugs, exposure to noise, general health status, anemia, fever, hypoalbuminemia, magnesium deficiency, and renal failure. Therefore, one of the problems encountered in a clinical trial is the identification of a proper control group that is matched in any aspect [19,20]. In this study, by testing patients' ears using the two drugs being studied, this issue was alleviated somewhat. Another issue in clinical trials is the potential adverse effect that the drugs being studied may interfere with the drugs being used for their therapeutic value. For example, in studying the potential beneficial effects of amifostine, D-methionine, and sodium thiosulfate in the case of systemic injections of cisplatin, its anti-tumor effects could be reduced, potentially resulting in inadequate treatment of the cancer or its recurrence [21-25]. In this study, higher concentrations of the otoprotective drug were provided in inner ear by injecting intratympanic N-acetylcysteine and dexamethasone as opposed to oral and parenteral administration of the drugs. Also, space was provided to separate the otoprotective and ototoxic agents, thereby reducing or eliminating any adverse intervention of the otoprotective drug with cisplatin that could decrease its tumoricidal function . There are few comparative studies in this regard, and the only drug that apparently has been studied sufficiently is amifostine, and that study did not produce promising results. Its administration is difficult and requires careful monitoring because of the possibility of life-threatening side effects; also, its otoprotective effect is suspect. N-acetylcysteine (NAC) analogues of cysteine could protect the inner ear by their strong anti-oxidant activity and the synthesis of glutathione. As a bioprotective agent, this drug is used against oxidative stresses and ischemic damages. Currently, it is used as an antioxidant, mucolytic agent in poisoning by acrylonitrile and meta-acrylonitrile, and it is used as an antidote of acetaminophen [2,26]. Considering the low molecular weight of NAC (163/2D), it is a good candidate for intratympanic injections and crossing the round window membrane (RWM) [2,27]. Corticosteroids, such as dexamethasone, are among those drugs that have been used successfully in inner ear diseases, including Meniere, SSNHL, inner ear autoimmune diseases, endolymphatic hydrops, and idiopathic, rapidly-progressive hearing loss. The mechanism of this drug is that it reduces the production of reactive oxygen species. In experimental studies, it has shown a protective effect against the ototoxicity of aminoglycosides with pathogens similar to cisplatin. Systemic injection of dexamethasone would result in various side effects, e.g., hyperglycemia, peptic ulcers, hypertension, and osteoporosis, and would reduce the effect of the chemotherapeutic agents [1,28]. In this study, N-acetylcysteine provided a better effect than dexamethasone, which may result from its better crossing the RWM and more glutathione synthesis. Other current issues include the protocol, time of injection, and suitable concentration of the otoprotective drug. These remain to be determined, and we have yet to specify what the most effective drugs are.Because of the short half-life of NAC (9-15 minutes) and its rapid clearance, the correct injection time for complete protection was be given serious consideration. Neuwelt et al. (2001) suggested that it be injected 30 minutes before chemotherapy. Jeffry Wu (2004) concluded that the administration of NAC reversed the cytotoxic and apoptotic effects if administered concurrently with cisplatin or up to 2 hour after cisplatin. However, its chemoprotective capability was reduced if its use was delayed more than 2 hour, and by 8 hours after the administration of cisplatin, its chemoprotective capability was minimal [1,29,30]. In this study, it was injected along with hydration before chemotherapy and an interval of 30-45 minutes between injections of otoprotectiveototoxic agents was observed. In an experimental study on guinea pigs, Choe realized that NAC with concentration of over 2% caused middle ear inflammation, which could result in discomfort and an increase in ototoxicity effect of cisplatin. In the Maria G et al. study, a 10% NAC solution was relatively bearable for all patients, but a 20% NAC concentration caused such pain and severe inflammation that the five patients who were evaluated were unable to continue the study. In this study, to dilute 20% NAC to 10%, Ringer's lactate solution was used because of its essentially neutral pH (6.75). Tanka F verified that using normal saline as the diluent increases the ototoxicity of cisplatin because of its being an acidic agent. The cause of higher bearable percentage relative to animal studies (10% vs. 20%) is that people have thicker RWMs than guinea pigs . In previous studies, different hearing methods have been used to evaluate the results of interventions and hearing changes, including DPOAE, PTA, and others [1-3]. PTA was used in this study because of its better correlation with the daily demands felt by the patients. In this study, the patients were examined periodically and no side effects, such as perforation of the tympanic membrane, ear infections, or inflammation were observed. Pain during injection that was reported as a side effect in other studies was not reported here we used analgesics before the injections, and we used the proper concentration of NAC [1-13]. Intra-tympanic injection has a number of limitations and disadvantages. The major limitation in this study was the timeconsuming process. Although the injection lasted only a few minutes, local anesthesia along with waiting time between injections in the ears and being motionless to allow drug to reach RWM resulted in long process, making it of limited use with children. Injections of NAC produced more significant results than injections of dexamethasone. However, protection was not complete, which could be related to other factors, including genetics, status performance, and others. This study had several advantages over other similar studies, including the relief of intratympanic pain with oral and local analgesia. This pain was the only side effect reported in previous studies [31-41]. In this paper, we compared two agents that have shown substantial otoprotective activity in the ears of one patient and that eliminated other confounding factors. We assessed the prevalence of tinnitus as a side effect of cisplatin, and we found that the effect of NAC in preventing cisplatin-induced tinnitus was unique among the other investigations. We included a large number of patients with a wide range of ages in our research. While the most suitable drug is still unclear, the main questions concerning the time of injection and the proper concentration of the drug have been answered approximately in this research. Thus, the results of this study could provide the protocol for preventing the ototoxicity of cisplatin in the future. Transtympanic injections of N-acetylcysteineas a safe and inexpensive antioxidant agent seem to be an effective otoprotective strategy for the prevention of cisplatin-induced ototoxicity. It use could reduce the incidents of treatment-induced hearing handicaps and eliminate the requirement of hearing aids and cochlear implants, especially for children. This could increase the patients’ quality of life while still allowing the chemotherapeutic drugs to function as intended and provide excellent survival rates. The authors thank the staff and directors of Shahid Sadoughi hospital for their help in this study. Dickey D, Muldoon L, Kraemer D, Neuwelt A. Protection against cisplatin-induced ototoxicity by N-acetylcysteine in a rat model. Hearing Res. 2004;193:25-30. Won-Taek C, Chinosornvatana N, Kay W. Prevention of cisplatin ototoxicity using transtympanic N-acetylcysteine and lactate. Otol Neurotol. 2004;25:910-15. Rozencweig M, von Hoff DD, Slavik M, Muggia FM. Cis-diamminedichloroplatinum (II): A new anticancer drug. Ann Intern Med. 1977;86:803-12. Williams CJ, Whitehouse JM. Cis-platinum: A new anticancer agent. Br Med J. 1979;1:1691-98. Moroso MJ, Blair RL. A review of cis-platinum ototoxicity. J Otolaryngol. 1983;12:365-9. Estrem SA, Babin RW, Ryu JH, Moore KC. Cis-diamminedichloroplatinum (II) Ototoxicity in the guinea pig. Otolaryngol Head Neck Surg. 1981;89:638-745. Laurell G, Bagger-Sjoback D. Degeneration of the organ of Corti following intravenous administration of cisplatin. ActaOtolaryngol (Stockh). 1991;111:891-98. Hinojosa R, Riggs LC, Strauss M, Matz GJ. Temporal bone histopathology of cisplatin ototoxicity. Am J Otol. 1995;16:731-41. Hoeve LJ, Mertenszur Borg IR, Rodenburg M, Brocaar MP, Groen BGS. Correlations between cis-platinum dosage and toxicity in a guinea pig model. Arch Otorhinolaryngol. 1988;245:98-102. Cardinaal RM, de Groot JC, Huizing EH, Veldman JE, Smoorenburg GF. Dose-dependent effect of 8-day cisplatin administration upon the morphology of thealbino guinea pig cochlea. Hear Res. 2000;144:135-46. Laurell G, Bagger-Sjoback D. Dose-dependent inner ear changes after administration of cisplatin. J Otolaryngol. 2000;20:158-67. Rybak LP. Cis-platinum associated hearing loss. J Laryngol. 1981;95:745-47.
iga MG, Chelis L, Kakolyris S, Papadopoulos S, Stathakidou S, Chamalidou E, et al. Transtympanic injections of N-acetylcysteine for the prevention of cisplatin-induced ototoxicity a feasible method with promising efficacy. Am J Clin Oncol. 2013: 36(1);1-6. Ravi R, Somani SM, Rybak LP. Mechanism of cisplatin ototoxicity: antioxidant system. Pharmacol Toxicol. 1995;76: 386-394. Lee JE, Nakagawa T, Kim TS, Endo T, Shiga A, Iguchi F, et al. Role of reactive radicals in degeneration of the auditory system of mice following cisplatin treatment. Acta Otolaryngol. 2004;124:1131-1135. Rybak LP, Whitworth CA, Mukherjea D, Ramkumar V. Mechanisms of cisplatin induced ototoxicity and prevention. Hear Res. 2007;226:157-167. Rybak L. Cis-platinum associated hearing loss. J Laryngol Otol. 1981;95:745-747. Vermorken J. Ototoxicity of cisdiamminedichloroplatinum (II): Influence of dose schedule and mode of administration. Eur J Cancer Clin Oncol. 1983;19:52-58. Dodd S, Dean O, Copolov DL, Malhi GS, Berk M. N-acetylcysteine for antioxidant therapy: Pharmacology and clinical utility. Expert Opin Biol Ther. 2008;8:1955-1962.
van den Berg JH, Beijnen JH, Balm AJ, Schellens JH. Future opportunities in preventing cisplatin induced ototoxicity. Cancer Treat Rev. 2006;32:390-397. Riedemann L, Lanvers C, Deuster D, Peters U, Boos J, Jürgens H, am Zehnhoff-Dinnesen A. Megalin genetic polymorphisms and individual sensitivity to the ototoxic effect of cisplatin. Pharmacogenomics J. 2008;8:23-28. Gratton MA. The interaction of cisplatin and noise on theperipheral auditory system. Hear Res. 1990;50:211-224.
van der Hulst RJAM, Dreschler WA, Urbanus NAM. High frequency audiometry in prospective clinical research of ototoxicitydue to platinum derivatives. Ann Otol Rhinol Laryngol. 1988;97:133-137. Blakley BW, Gupta AK, Myers SF, Schwan S. Risk factors for ototoxicity due to cisplatin. Arch Otolaryngol Head Neck Surg. 1994;120:541-546. Schaefer S, Post JD, Close LG, Wright CG. Ototoxicity of low and moderate dose cisplatin. Cancer. 1985;56:1934-1939. Laurell G, Jungnelius U. High dose cisplatin treatment: Hearing loss and plasma concentrations. Laryngoscope. 1990;100:724-734. Oldenburg J, Fossa° SD, Ikdahl T. Genetic variants associated with cisplatin-induced ototoxicity. Pharmacogenomics. 2008;9:1521-1530. Feghali JG, Liu W, van de Water TR. L-n-acetyl-cysteine protection against cisplatin-induced auditory neuronal and hair cell toxicity. Laryngoscope. 2001;111:1147-1155. Atkuri KR, Mantovani JJ, Herzenberg LA, Herzenberg LA. N-acetylcysteine-A safe antidote for cysteine/glutathione deficiency. Curr Opin Pharmacol. 2007;7:355-359. Pinkus R, Weiner LM, Daniel V. Role of oxidants and antioxidants in the induction of AP-1, NF-kB, and glutathione S-transferase gene expression. J Biol Chem. 1996;271:13422-13429. Eastwood H, Pinder D, James D, Chang A, Galloway S, Richardson R, et al. Permanent and transient effects of locally delivered n-acetyl cysteine in a guinea pig model of cochlear implantation. Hear Res. 2010;259:24-30. Munguia R, Sahmkow SI, Funnell WR. Transtympanic Ringer’s lactate application in the prevention of cisplatin induced ototoxicity in a chinchilla animal model. Otolaryngol Head Neck Surg. 2010;143:134-140. Choe WT, Chinosornvatana N, Chang KW. Prevention of cisplatin ototoxicity using transtympanic N-acetylcysteine and lactate. Otol Neurotol. 2004;25:910-915. Abi-Hachem RN, Zine A, van De Water TR. The injured cochlea as a target for inflammatory processes, initiation of cell deathpathways and application of related otoprotectives strategies. Recent Pat CNS Drug Discov. 2010;5:147-163. Tanaka F, Whitworth CA, Rybak LP. Round window pH manipulation alters the ototoxicity of systemic cisplatin. Hear Res. 2004;187:44-50. Rademaker-Lakhai JM, Rademaker-Lakhai JM, Crul M, Baas P, Beijnen JH, Simis YJ, et al. Relationship between cisplatin administration and the development of ototoxicity. J Clin Oncol. 2006;24:918-924. Konrad-Martin D, Konrad-Martin D, James KE, Reavis KM, Phillips DS, Bratt GW, et al. Evaluation of audiometric threshold shift criteria for ototoxicity monitoring. J Am Acad Audiol. 2010;21:301-314. Duan M, Qiu J, Laurell G, Olofsson A, Counter SA, Borg E. Dose and time-dependent protection of the antioxidant N-L-acetylcysteine against impulse noise trauma. Hear Res. 2004;2:1-9. Grinberg L, Fibach E, Amer J, Atlas D. N-acetylcysteine amide, a novel cell-permeating thiol, restores cellular glutathione and protects human red blood cells from oxidative stress. Free Radic Biol Med. 2005;38:136-145. Shi R, Huang CC, Aronstam RS, Ercal N, Martin A, Huang YW. N-acetylcysteine amide decreases oxidative stress but not cell death induced by doxorubicin in H9c2 cardiomyocytes. BMC Pharmacol. 2009;9:7. Borkholder DA. State-of-the-art mechanisms of intra-cochlear drug delivery. Curr Opin Otolaryngol Head Neck Surg. 2008;16:472-477.
International Otorhinolaryngology Research Association (IORA), Universal Scientific Education and Research Network (USERN), Tehran, Iran. Paper submitted to the ITJ-EM (Editorial Manager System) on February 15, 2018; and accepted on April 27, 2018. Citation: Sarafraz Z, Ahmadi A, Daneshi A. Transtympanic Injections of N-acetylcysteine and Dexamethasone for Prevention of Cisplatin-Induced Ototoxicity: Double Blind Randomized Clinical Trial. Int Tinnitus J. 2018;22(1):40-45.